When we posted our blog last night, we had no idea that Bubba was planning a surprise. 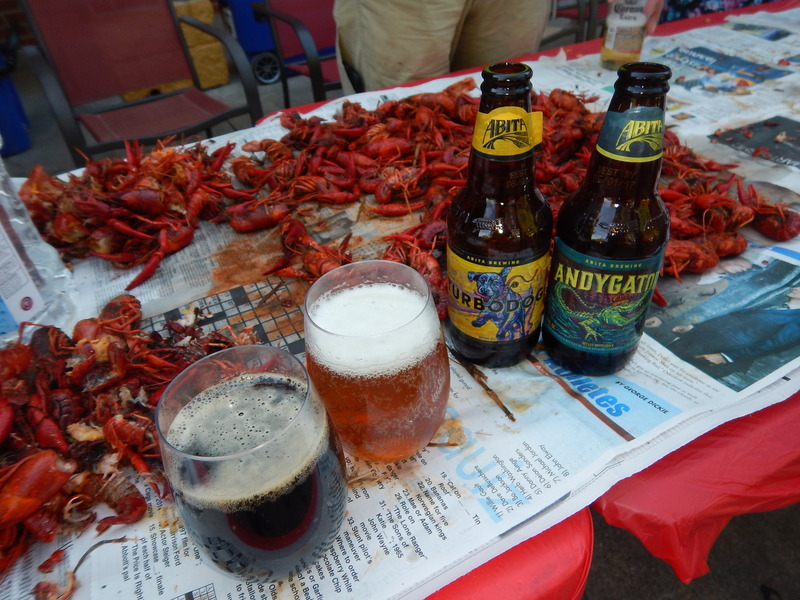 It was a welcome to Louisiana, or farewell to Texas party. 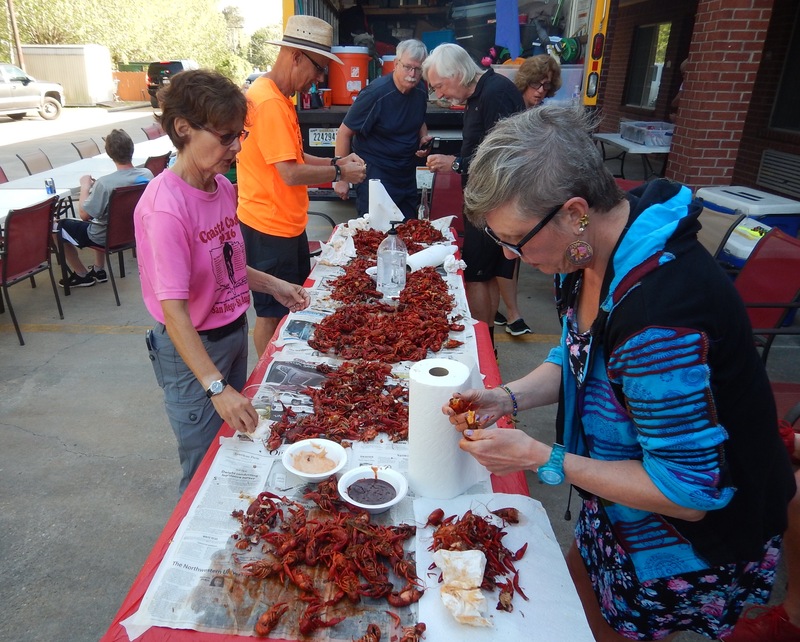 Crawdads and an open bar made for a fun celebration. It was national beer day, and we celebrated in style with some local brews. Today, a long and hard day on the road. 91 mostly-flat miles, in a headwind. We just barely make it in under 6 hours. 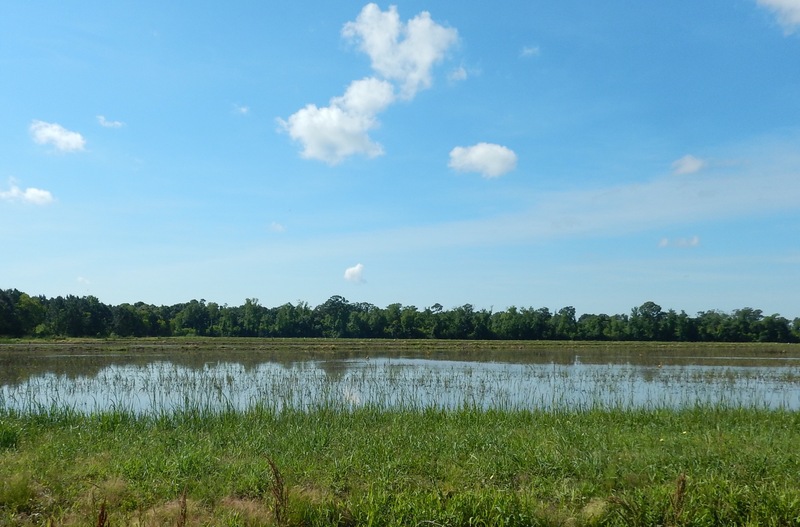 We experience some very different scenery here in Louisiana, including rice paddies and crayfish bogs. 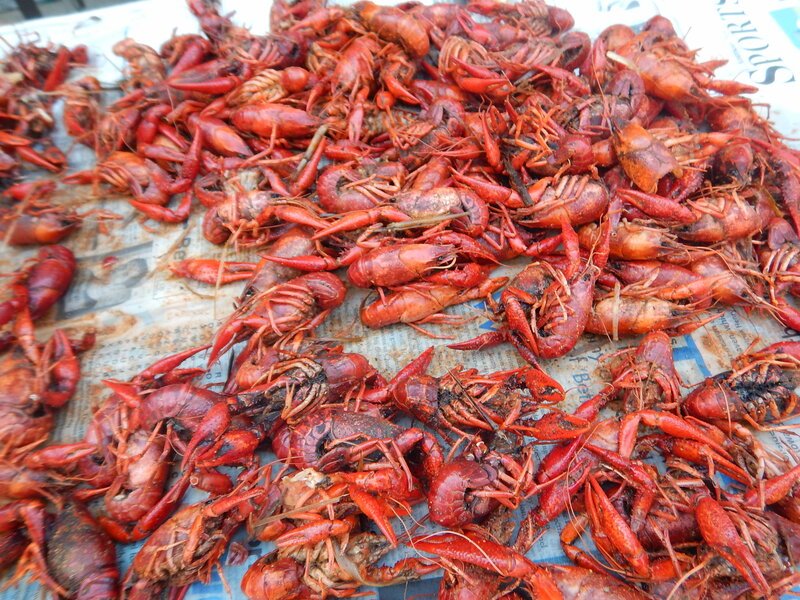 Apparently the farmers alternate use of the bogs between rice and crawfish. 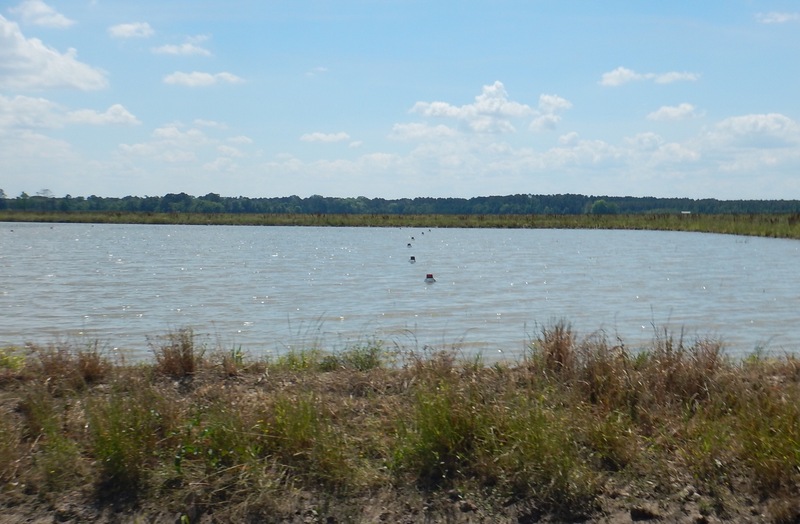 They grow a rice crop and seed the crawfish before harvesting, reflood the rice crop, and it’s a crawfish pond. Our lunch spot is also an experience! 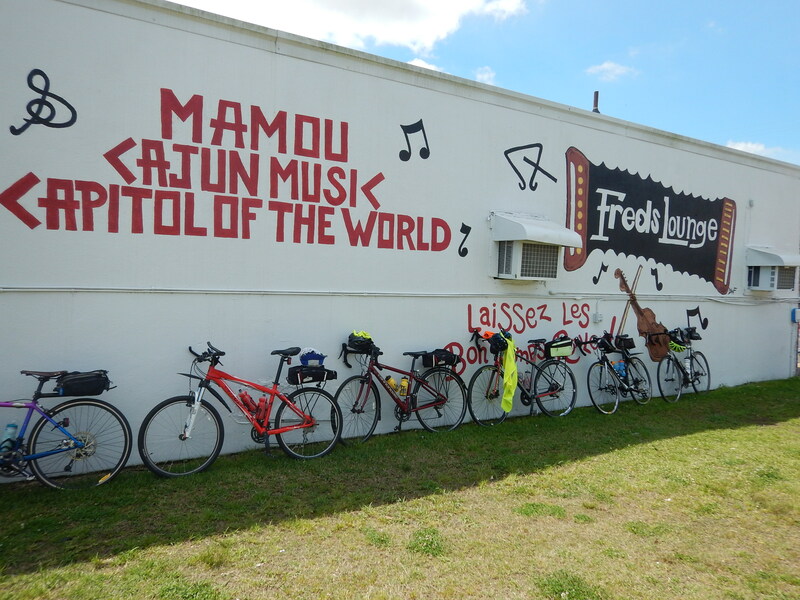 We are in Mamou, Louisiana, the home of Fred’s Lounge, where the band is rockin’ out some zydeco. 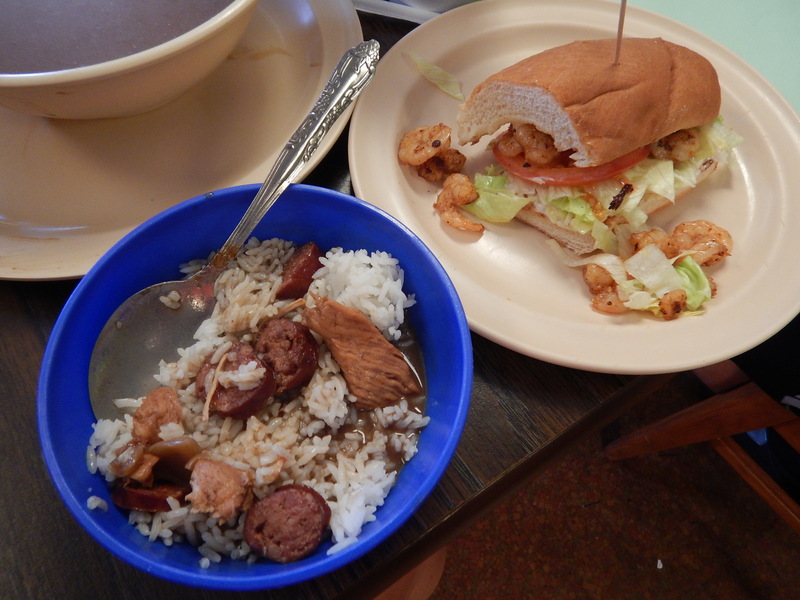 We check out the bar and then head across the street to The Crazy Cajun for a lunch of gumbo and grilled shrimp Po’Boy. 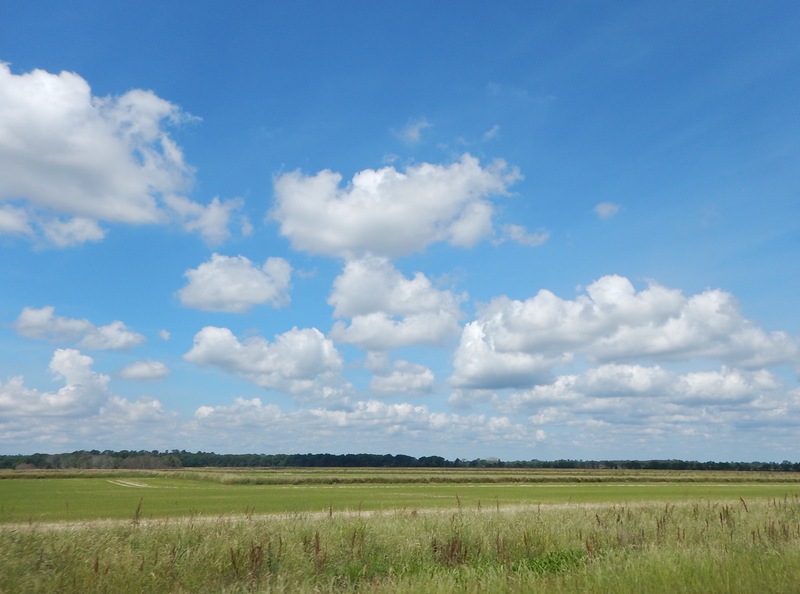 Are those puffy clouds? It’s been quite a while since we’ve seen such a pretty sky! 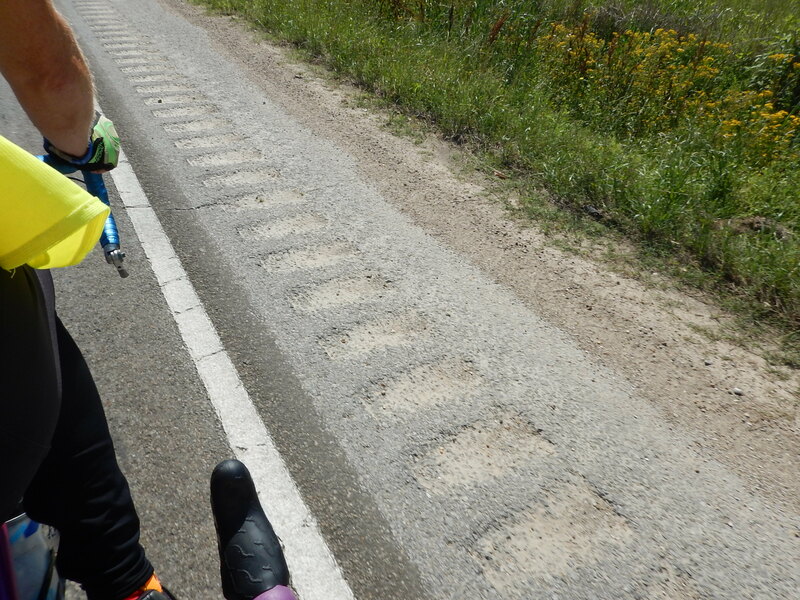 Two words about the road surfaces today: rumble strips. Ugh – so many of the beautiful shoulders are ruined (for cyclists) when half of the shoulder is filled with a giant rumble. Some of the rough surfaces make us miss the Texas chip seal. It’s a real treat that we are spending our second consecutive night in a hotel. I could get used to this…but there is only one more hotel night in the final 16 days of this tour! 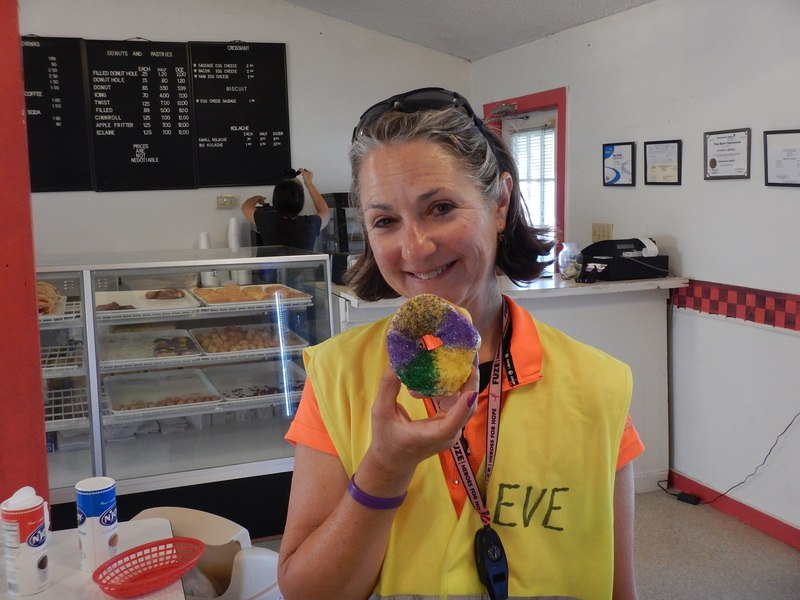 Oh, I almost forgot to show you my beautiful Mardi Gras donut! Tomorrow: we wish it were a rest day, but we have to cross the mighty Mississippi. What a colorful post today! Turn around and come back to Texas. The guest bedroom is open. 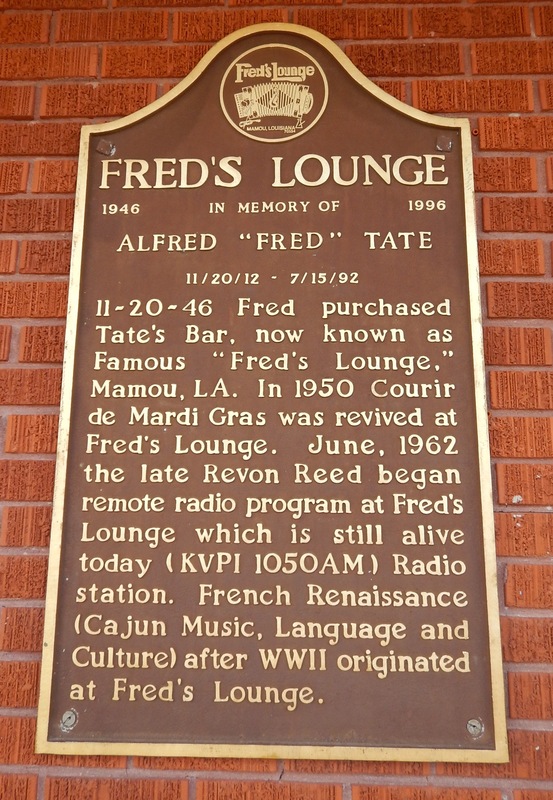 Get some Crawfish Etouffee over a giant Fried Redfish or Fried Catfish. You will not even think about rumble strips. All will be right with the world. 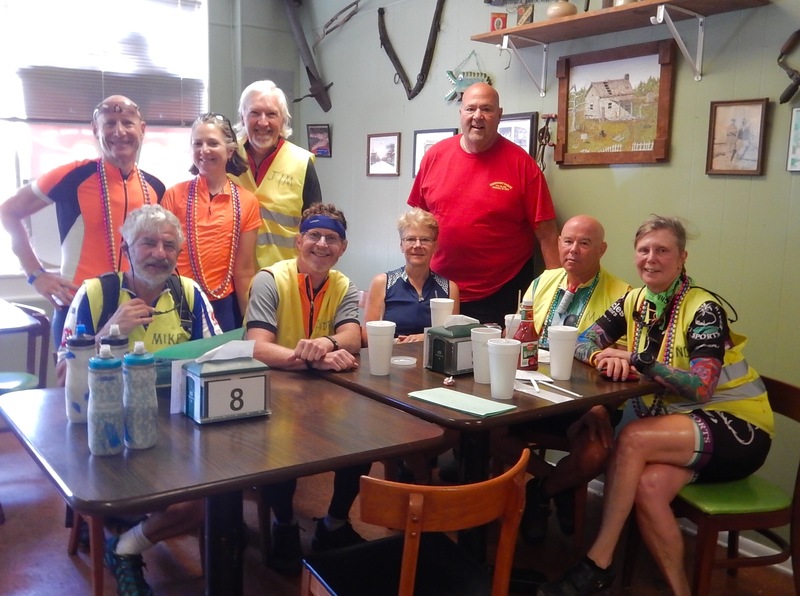 Hi Eve & Roger – I’m Bob Myers from the 2014 C2C alumni. I’ve been following your blog, and wanted you to know that I’ve really enjoyed your daily posts. Brings back a lot of fond memories from my ride. — enjoy the rest of your journey. You’ll be amazed how quickly the remaining time goes by (now that you’re out of Texas 😀). Thanks for the nice wishes, Bob. And thanks for reading!